Walk like an Egyptian with Pharaoh’s Luck multi scratch card. Match to reveal lucky symbols and big jackpots. 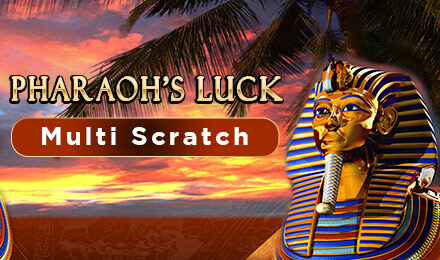 Pharaoh’s Luck Multi Scratch Cards is a multi-scratch game which offers up many different ways to win. It has an Ancient Egyptian theme with a really exciting jackpot treasure. As a multi scratch card you have five different chances to win, including the scooping up the mega Pharaoh’s jackpot, which increases every time you play the game. The Pharaoh’s Luck Multi Scratch Card is covered in symbols which could win you a prize. The more matches you score the higher the prize you’ll win, and the Match and Win pay table shows you all the various cash prizes up for grabs. The game also has two innovative features: heads or tails and fast cash, to give your luck a boost for a thrilling scratch-to-win game play. This scratch card has an intriguing theme with a juicy jackpot treasure making for a different scratch card game experience.